We are at home! It was so wonderful to sleep in our own beds last night! We got home around 7:30pm and were all asleep by 10:30pm. Riley slept until 4:30am and woke up to eat. After getting her incisions cleaned, she went back to sleep and slept until 9:30am! I truly cannot believe how well she has been resting. 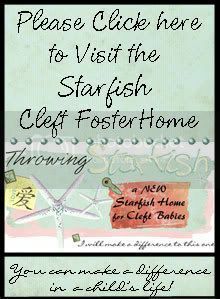 Our experience at Children’s Hospital Boston was amazing. All of the staff were so nice and took excellent care of us. Of course Dr. Mulliken is great or we wouldn’t have even gone to Boston, but I’d like to mention all of the other wonderful other people we met. The staff in pre-op, holding and the waiting area were so nice. The chaplain came by in pre-op and prayed with us before we moved to holding. Riley’s anesthesiologist was super nice and caring. He explained how he would put her to sleep and relieved a lot of my anxieties about that. He even came back to talk with us in the waiting area after Riley woke up to tell us how great she did during surgery. Then he came back to check on Riley Friday morning to see how her night went and to make sure she was comfortable. I thought that he went above and beyond what a lot of other anesthesiologists do. Our day nurse Thursday and Friday was Valerie. She was great–checked on Riley often, and stayed on top of her pain medications. She was diligent in keeping the iced saline on the gauze to help reduce swelling. She loved our accents and called us her “Alabama family.” It never failed though, if she was in our room, they were paging her overhead to go to another room! Valerie made sure to tell us that Riley was “not normal–most babies don’t eat and cry a lot.” Riley ate like a champ and didn’t cry any more than she normally does at home. Our night nurse the first night was Loren and she had a student nurse, Colleen. They were awesome. They, too, checked on us often and stayed on top of Riley’s pain meds. 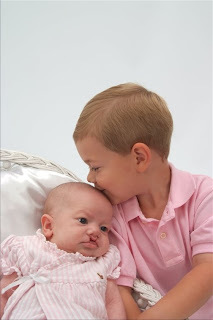 They were diligent about keeping Riley’s incisions clean–something Dr. M is adamant about. Loren even offered to feed Riley for me at night so we wouldn’t have to get up (I didn’t let her but was so appreciative that she offered). Mary Anne was our nurse the second night and was great too. A doctor from the plastic surgery team came in Saturday morning and removed Riley’s nasal packing. Then Dr. M came by and sent us home! Needless to say that Brock was very excited about going home on Saturday as opposed to staying until Tuesday! Riley’s repair is not complete. This was only the first stage. Dr. Mulliken performed a lip/nasal adhesion–meaning he only closed the white part of her lip and made her left nostril match the right. The red part of her lip is the same as before and will be corrected with the final reconstruction sometime between August and November. She has a Logan’s bow over her lip to protect it. It is simply taped to her face and the tape will come off on it’s own in the next week or two. Brock says it makes her look like a football player. Riley has to wear the elbow immobilizers (aka welcome sleeves, or no-nos) to keep her from touching her lip. She is supposed to wear them for the next 4 weeks. Her lip is still pretty swollen and I can’t wait for it to go down so I can see what she *really* looks like. Thanks to everyone for thinking of us and praying for us. Our prayers have been answered once again. We couldn’t have asked for things to go any better or smoother! Oh, and Dr. M said we could probably come home after we're discharged on Saturday (Brock is very excited about that)! Riley had pre-op this morning. We met with a nurse practitioner who assessed her, weighed her (9lbs 3oz) and took her vital signs. She told us a little about the surgery process. We then talked with anesthesia who just told us how Riley will be put to sleep tomorrow. Finally we met with Dr. Mulliken's nurse practitioner who explained in more detail about what will happen after surgery (wound care, feeding, etc.). Riley was so great during all of this, bright eyed and smiling some of the time, sleeping soundly the rest. Then Brock and I enjoyed some wonderful brick oven pizza. We then went for Riley to have an ultrasound. She has a small dimple/skin fold on her sacrum and they wanted to make sure her spine is normal. It is! She was a perfect angel during the ultrasound and slept the whole time just like the tech wanted her to! We left Atlanta bright and early this morning and arrived in Boston around lunch. Riley did so great on the flight and slept the whole way! We just got back to the hotel from meeting with Dr. Mulliken. 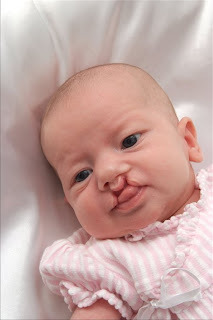 He says that her cleft is not as bad as he had initially thought from looking at some pictures I had sent him. He said that he *might* have not even done the surgery in two stages if he had seen her in person prior to now, but says that she will have a "superior result" from the surgeries. He plans on doing the lip adhesion on the left side, gum line closure on the left side and may even do a small lip adhesion on the right side and get both sides as even as possible. Surgery is scheduled for 7:30am on Thursday--Riley will be the first case. We also got some more good news. 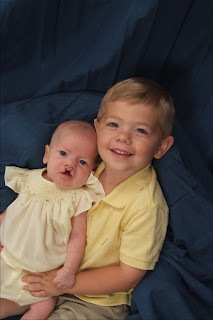 Our pediatrician said that Riley had a submucous cleft palate, meaning that there is a cleft in her palate but it is covered by the tissue/lining of her mouth. Depending on severity, submucous cleft palates can require surgical repair just as if it were an open cleft palate. 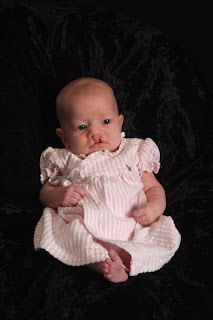 Dr. Mulliken says that Riley has a "very minor" submucous cleft and was very impressed that our pediatrician even found it. He does not feel that it will require surgical repair, although we won't be completely sure until we see how her speech develops (around 2 years old). Riley had her 1 month check-up yesterday. She weighed 8 lb 14.5 oz and was 22.125 inches. So she has gained almost 1lb since birth and almost 1.5lbs since discharge from the hospital and has grown a little over 2 inches! She did have some fluid in her right ear which her pediatrician wanted to treat with antibiotics to prevent any infection. We also visited my work and made her first Wal-Mart run and she did great! Today, I went for my postpartum check-up. Everything is fine and I've lost 24lbs! Only 7lbs to my pre-pregnancy weight (although I need a lot of toning)! We then went to have Riley and Sawyer's pictures made. I wanted to have pictures of Riley's *first* face since she'll be having her first surgery next week. The pictures turned out really good considering we had to wait an hour, it was lunch time by then, Riley had been up since 6:30 and Sawyer woke up on the wrong side of the bed! The last picture is quite possibly my favorite--and it was taken right before Sawyer almost dumped Riley on the floor! When will Sawyer learn that being potty trained is a good thing? When we go somewhere he does great, staying dry and letting me know when he needs to go. When we are at home he does horribly, wetting his pants constantly and always denying that he needs to go. I guess he'll do it when he's ready. Let's hope he's ready soon. Happy birthday Riley!! We love you so much and are so very blessed to have you! Riley has given us a few *real* smiles. I captured one in the picture while Brock was holding her. Last night, Sawyer was holding her before bed and kissed her and she gave the biggest smile! It was the sweetest thing! Here are some random pictures from the past week, week and a half. Sawyer had a great time playing in the mud following some of the massive rain we got. He's doing better in the behavior department. I'm trying to remember to take Riley's picture every week in the Boppy so I can see how much she's growing. She's doing great...eating well and sleeping well. Can't wait to see how much she weighs at her check up next week!